Iowa hosts Wisconsin « Roll Out the Quevedo! Coming off the heels of the monumental victory over top ranked Ohio State, optimism is high! I would suspect that it will remain high after today’s loss. I have been convinced this team would lose this game all year, I remain so. I also remain convinced that UW will play extremely well today. The Iowa-Wisconsin matchup has become one of the better ones in this league, particularly with the demise of the Michigan-Ohio State matchup. The Battle for the Bull is tied at 41-41 all time, with Iowa having won the last two. 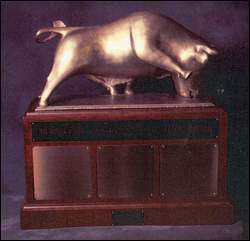 What will decide the battle for the heartland bull? Quite simply the gap between these two teams at this point is probably the health of Wisconsin and the strength of Iowa’s defense. UW may be without Nick Toon, they are without Jordan Kohout, not to mention the continued absence of Chris Borland. This will be classic football, power running, no nonsense, no spread, no trickery…line up and hit each other in the face. Here’s how it will go: UW’s offensive line can push Iowa around. At the end of the day, who ever turns it over will lose. Both teams figure to move the ball, long, arduous, physical drives. Ricky Stanzi and Iowa have a fine passing game, and can run it. Tolzein and Wisconsin can throw it, and have a superb run game. UW figures to try and replicate the game plan from Saturday and keep Stanzi on the bench. They will probably succeed in some measure–but at the end of the day there will be a turnover that costs this game. Wisconsin is simply not as sound as Iowa is on defense. I like Wisconsin to battle and make this one of the better games, but the game is in Iowa City and the game will be tight until late. I like Iowa by a field goal. No letdown, I suspect Wisconsin will remove themselves from BCS contention but gain respect in the process.